It is already common knowledge that tourism is one of the biggest successes for the Spanish economy. Travelers are now more informed than ever before, instantly sharing their experiences whilst travelling and having the ability to have a much more extensive knowledge of a city before stepping on a plane. The fifth LUCA talk will be taken by Senior Data Consultant at LUCA, Elena Diaz. 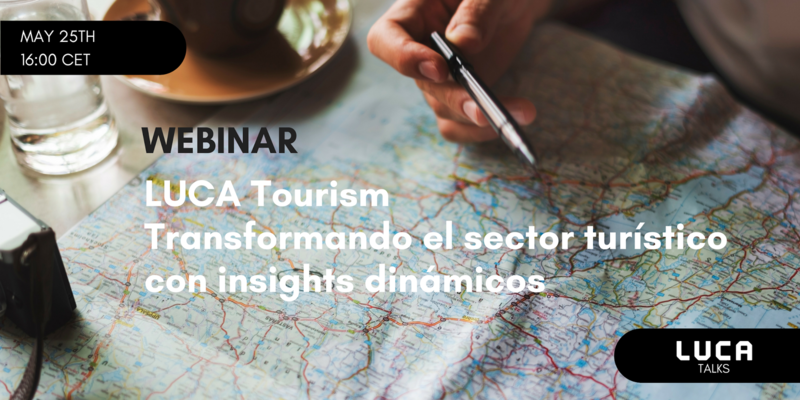 Elena will highlight the ways in which LUCA Tourism can help businesses more acutely execute their marketing plans and lead them to make more optimized decisions based on the benefits of Big Data. The webinar will take place on the 25th of May between 4pm and 5pm, do not hesitate to register here. Elena will be more than happy to answer questions surrounding this topic.